Perhaps the most underappreciated element of a truly great horror flick is the use of sound. The implementation of the creepy or the complete unsettling silence, sound in scary situations is vital to executing an effective horror. One of these well-made films, in surprising fashion, comes from an unlikely source, a former television comedy star in John Krasinski, who seemingly announces his entrance onto the scene with an incredible film. In 2020, the world goes into lockdown as blind extraterrestrial creatures with extremely sensitive hearing hunt by sound. The Abbott family struggles to survive in this new world in which the creatures have become aware of the Abbott family’s presence. A dystopian future as a setting for a scary movie is nothing new, but the concept within this world is truly unique, both in narrative and execution. A Quiet Place does a really great job of telling a family story within a horror world, where the monsters are certainly dangerous, but the focus is on the characters. It is a picture-perfect example of great storytelling done with little dialogue, opting for sounds and visuals to convey its ideas instead. Every performance is somewhat remarkable, noteworthy for the skill needed to portray such emotion in a near dialogue-less film. John Krasinski brings a sort of stoicism to the film, hiding the terror behind a strong facade as he tries to protect the things he loves. Emily Blunt is incredibly versatile, with an emotional presence as she tries to retain a sense of normalcy amidst the insanity of the world and exceptional chemistry with her real-life husband. But the stand out here, delivering another fantastic performance, is Millicent Simmonds. Her own hearing impairment becomes a part of her character and integral to the plot by the time the credits roll. The best horror films do a good job of establishing the rules and the chilling opening scene does this perfectly through only visuals, only to be ever so slightly undone with Krasinski directly spelling it out later on a whiteboard. However, the sound design is masterful, using silence and precisely timed sounds to elevate the intensity of a tremendously well executed film from top to bottom. The world feels real and the life that this family has built has tangibility to it, from the various measures of defense in place to the safety precautions of knowing every inch of a floorboard that creaks. 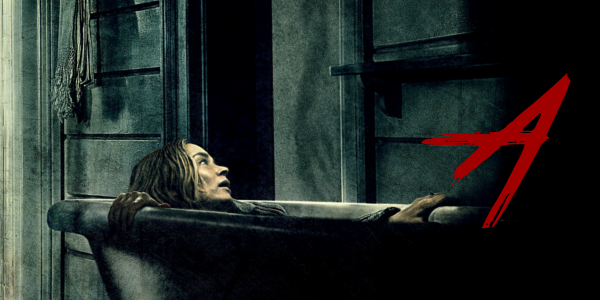 Overall, A Quiet Place is an excellent example in what properly executing the technical side of a horror film can do for the film as a whole. Add in that the world itself is interesting and, outside of one heavy handed exposition whiteboard, doesn’t hold the audience's hand or say too much. They mystery of the creatures and their presence on Earth only builds the tension further. Krasinski may not have had much success on his first two directorial efforts, but A Quiet Place has firmly established him as a filmmaker to watch.